It has been nearly a week since I posted a new “dig report” blog post, and this has actually happened for several reasons. First, there has not been a whole lot of significance to report: our daily plan is to dig in a specific area, and call one of the dig directors over to our area if we find anything of significance. But, this is a vast oversimplification, and not reason enough to keep me from writing. 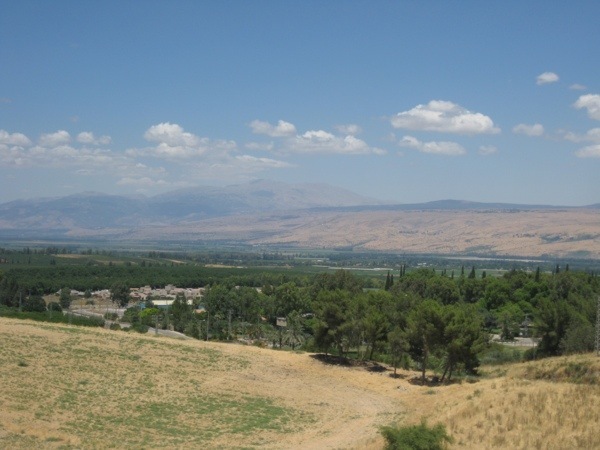 A view from Tel Hazor to the northeast, towards Syria. As a general word about my section’s progress, we have dug our huge area down to about knee-length depth, and we haven’t really found much of significance: simply a lot of pottery and a lot of bones, but even more pottery. What we have found continues to tell the same story: our section is full of both Middle and Late Bronze Age sherds of pottery, and it seems to have been a “fill” in the Late Bronze Age. For reasons unknown, of course. I think I mentioned in one of my earlier posts that the section adjacent to ours has a thorough, well preserved mud-brick wall that may, in some way, connect to our section. The thought is that our section, since it is substantially lower than the mud-brick section, could contain part of a floor relating to the mud-brick structure. That theory could eventually prove true, because the diggers in the mud-brick section have come upon the top of a few pithoi (singluar: pithos), or large storage jars, that seem to be intact, at the same level, and therefore possibly sitting on a floor somewhere below. I didn’t snap a picture of the jars, but I did get a picture of Harel working at the mud-brick wall. Harel, an Israeli archaeology student, poses for me by the special mud-brick wall that has consumed a lot of the dig directors’ time and energy. 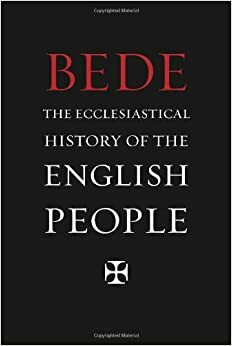 In my specific section, the day was unremarkable, in large part because we had so many bucket chains, not to mention a special “rock chain” because a group digging the south end of Area M deconstructed an area-wide stone wall. I believe I’ve also mentioned bucket chains before; we diggers line up in somewhat of an assembly line and remove our dirt by passing our buckets to a particular location, which for us has generally been the south end of the area. A couple of times a week, a Caterpillar tractor will come to the tel and remove the big bags, which we call balot, for disposal elsewhere on the tel. Below is an example of one of the bucket chains in action. I took this photo from the northern end of my section of the area, while waiting for the bucket chain to begin in earnest from our buckets. Buckets are being chained up the area (from left to right in this photo) toward the balot, where someone is throwing them, and another is catching and stacking the buckets. We do bucket chains so often, and sometimes digging so sparsely, that perhaps digs should be renamed Old Dirt Removal for the sake of truth-in-advertising! The last hour of the day was spent in another tour of the previous excavations of the area. 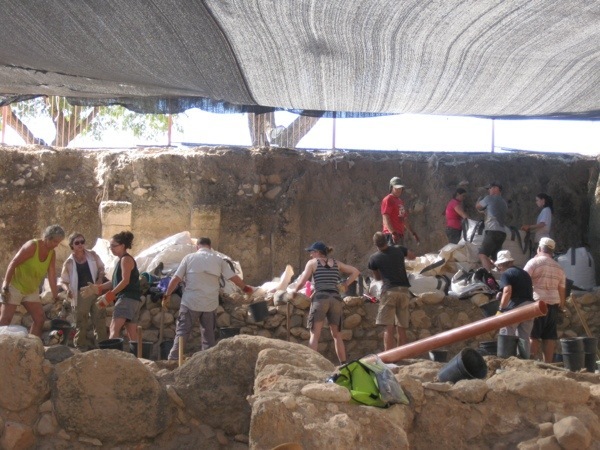 While last week we received a tour from Amnon Ben-Tor of the eighth, ninth and tenth century (BCE) features of Hazor, this tour (led by Sharon Zuckerman of the Hebrew University) examined the Canaanite features of the Middle and Late Bronze Ages. This included a tour of the major temple on the site, from which I have numerous pictures up today on my Flickr site. Two of them, though, are below. 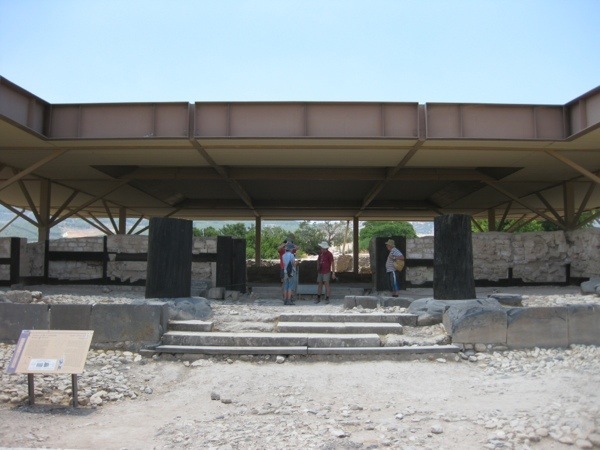 This is the entrance to the royal, ceremonial temple of Hazor’s Canaanite era. 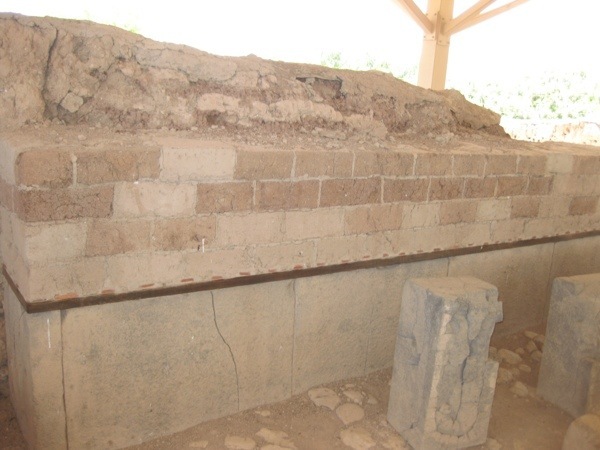 This is an interior wall of the Canaanite temple, made of three different materials emblematic of similar Northern Syrian temples of the era: a basalt base, (Lebanese cedar) wood plank, and mud bricks. Inevitably so, a number of crumbling mud bricks are visible at the top of this wall. The four of us North Americans (there are actually more – at least three other Americans and one other Canadian – but they are older and not as into adventure as us!) have planned a weekend trip of our own, separate from the South Africans this time. We will be renting a car beginning tomorrow afternoon so that we can go kayaking on the Jordan River on Saturday, followed by swimming and minor sightseeing around the Sea of Galilee. On Sunday, we will head to the west to see the Mediterranean, including Haifa, Caesarea (Maritima), and Megiddo. It will be nice to blaze our own trail this weekend, and especially to just take it easy on Saturday along the water. My intentions could change, but I don’t see myself posting an update tomorrow after the dig. I hope everyone back home had a good 4th, and will have a better weekend! Yes, I understand that you didn’t tell me but am so thankful you are feeling better. You know I had a lump in my throat when I read you had been sick. Enjoy your weekend trip and be safe, especially in and near the water. Interesting you are able to rent a car – how does that work in reference to a drivers license? They care more about my passport than my driver’s license, actually. All I need is to have had my license for more than two years and be at least 24 years old. No problem! Cory and I are both registering as drivers for the car, and we’re getting a pretty good deal too. Home. Glad you are feeling better. Sounds like a fun wkend ahead for you. Enjoy & be safe!